The other day I was happily baking away when I discovered that Mr8 and the kids had used up ALL of the brown sugar on their porridge. So I figured there had to be a way to make my own right?! And there is! I kid you not, you can make your own brown sugar in a matter of minutes with only 2 INGREDIENTS! Hmmm, that sounds like the title of a potential book…..maybe not. Anyway, it can be done, with absolutely no fuss at all, so here we go…..
Place the sugar and molasses in a medium sized mixing bowl and stir together. Now, you can do this using the paddle attachment on your electric mixer, but as we all know, I am without one at the moment because I blew the motor when I took my eyes off it making Eggless Marshmallows, so I did this by hand using a dessert spoon. And to tell you the truth, you don’t really need to use a mixer, it’s just extra washing-up. 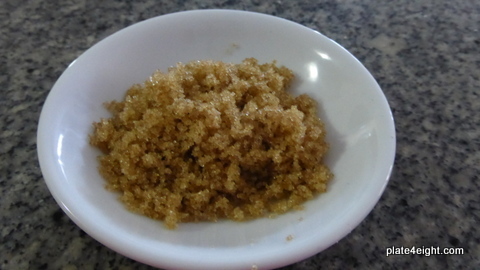 Once all of your white sugar resembles brown sugar, transfer to an air-tight container and store in your pantry. It’s as simple as that! Notes: If you want to make Dark Brown Sugar, gradually add more molasses until it’s just how you want it. And molasses may not be something you usually stock in your pantry (mine was left over from Christmas baking), but it’s worth grabbing if you see it in your supermarket. It makes the best Gingerbread.